Mini Lesson from Matthew 2:11 (NKJV) w/ TAK Print & Go! 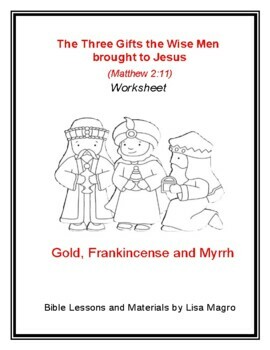 This easy mini lesson is a simple way for your students to learn the three gifts the wise men brought to Baby Jesus in Matthew 2:11. This handout can be used as teaching or supplemental material in a family Bible study, Sunday School, homeschool, school, VBS, camp, retreats or church small groups. 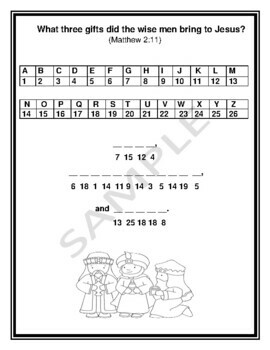 Pass it out to a group of students and see who can complete it first! When I was working on the "The Birth of Jesus Christ" Bible lesson, I researched frankincense and myrrh. I found them on-line and was able to purchase them. Having never smelled them before, I found it to be a rather remarkable experience. I think your students would enjoy smelling them as well. For your students to know that these gifts were used in biblical times as well as today would be so beneficial for them. For example, frankincense and myrrh are used today in the medical field.